Sally G. McMillen is the Mary Reynolds Babcock Professor of History and Department chair at Davidson College. Her newest book, now out in paperback, Seneca Falls and the Origins of the Women’s Rights Movement illuminates a major turning point in American women’s history, a convention and its aftermath, which launched the women’s rights movement. Below I share the interview I conducted with McMillen about this tumultuous time in our nation’s history. Be sure to check out McMillen’s previous OUPblog posts here. OUP: While I was reading the book, I was completely shocked at just how scandalous it was for a woman to merely speak in public. Why was that? Professor Sally McMillen: The idea of American women speaking in public to mixed audiences was unacceptable until the mid-nineteenth century. They could address other women, and Quaker ministers like Lucretia Mott spoke in meetings. In the late 1830s, when Sarah and Angelina Grimke addressed audiences of men and women, New England ministers were shocked. Women should confine their activities to the domestic arena and not presume to be experts on moral issues—in this case, slavery. In 1837, these ministers issued a formal “Pastoral Letter,” objecting to the sisters’ audacious behavior. Their “Letter” was read in churches across New England, denouncing the two for stepping beyond the female sphere. This caused a number of women to realize that they were as enslaved as the slaves they were trying to free. It also led to Sarah Grimke’s writing one of the earliest treatises on women’s rights, Letters on the Equality of the Sexes. Nearly a decade later, Lucy Stone, who attended Oberlin Collegiate Institute, discovered that the school did not allow female students to study rhetoric, to debate, or to speak in public. Later, during her career as a public orator for the anti-slavery movement, Stone sometimes found herself drowned out by rowdy protestors and pelted with rotten vegetables and books. Finally, by the 1850s, such reactions subsided, and women’s voices were heard. OUP: From Hillary Clinton’s pant suits to the cost of Sarah Palin’s clothes, a female politician’s appearance is heavily scrutinized today. Did the suffragettes have this problem as well? McMillen: Clothing has always been an issue for women that can elicit strong responses. In the mid-nineteenth century, female attire consisted of layers of petticoats, tight corsets, and floor-length dresses. Tight lacing caused health problems by constricting internal organs. 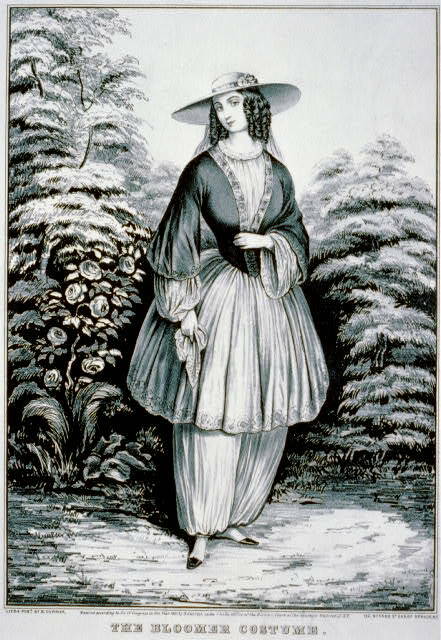 In 1850, Elizabeth Miller returned from Europe where she had worn the “Turkish costume” with puffy pants and a short skirt. Welcoming this freedom of movement, soon her cousin Elizabeth Cady Stanton adopted the outfit, as did Lucy Stone and Susan B. Anthony. Amelia Bloomer’s newspaper ran sample patterns, and the new fashion statement now had a name (“bloomers”). But the comfortable costume had an abbreviated life, for the public and the press ridiculed women for such unsightly, unfeminine attire. Female reformers soon realized that their clothing caused negative reactions, for audiences paid more attention to their clothing than to their agenda. Stanton reluctantly returned to traditional attire, and others followed suit. OUP: I was surprised that Oprah asked Sarah Palin about how she could manage the vice presidential position and kids at the same time. Did people ask the suffragettes if they could manage their kids and advocate for the vote? Elizabeth Cady Stanton had seven kids! McMillen: Motherhood and the responsibilities associated with it resonate across the ages. Several leaders of the nineteenth-century women’s rights movement bore children and faced the demands of motherhood. Lucretia Mott was fortunate to become involved in the women’s rights movement after her children were grown. She also had help from her supportive husband and extended family members. Elizabeth Cady Stanton bore seven children and raised them according to her unique approach to parenting. Although she was a principal organizer of the 1848 Seneca Falls Convention, Stanton did not attend a single women’s rights convention until 1860 because of her children. Lucy Stone, also at the heart of the women’s movement and a famous anti-slavery orator, bore her only child in 1857. She planned to remain involved but could not find dependable help. Soon Stone withdrew from public life to raise her daughter, not returning until the Civil War. On the other hand, single women like Susan B. Anthony complained that motherhood prevented fellow suffragists from devoting themselves to a movement that consumed her life. OUP: Why did women’s rights activists meet such resistance from women? OUP: Today, we often hear the mantra, “Women’s Issues are everyone’s issues.” How did increasing women’s rights in this time period benefit men? McMillen: Women’s issues are everyone’s issues, which a number of men in the mid-nineteenth century realized. Wendell Phillips led the unsuccessful fight to seat eight female delegates at the 1840 World Anti-Slavery Convention in London. William Lloyd Garrison welcomed women into the American Anti-Slavery Society and elevated Abby Kelley Foster to a position on its Executive Council. Frederick Douglass spoke on behalf of female suffrage at the 1848 Seneca Falls Convention and convinced the audience to support women’s right to vote. Men made generous donations to the women’s movement. Liberal ministers like Thomas Wentworth Higginson and Samuel J. May lectured, wrote, and preached to support the cause. These men realized that a democratic society treated everyone as equals, and women’s voices and participation in the nation would enhance the lives of all. OUP: What other books should we read about this topic? McMillen: The best overview of the movement is Eleanor Flexner’s Century of Struggle, which is a half century old but offers broad coverage of women’s fight to end oppression. Two biographies of Elizabeth Cady Stanton–Elisabeth Griffith’s In Her Own Right and Lori Ginzberg’s recent study, Elizabeth Cady Stanton–do full justice to this bold, spunky intellectual and major presence in the nineteenth-century women’s rights movement. A delightful photographic record of the seventy-two year struggle is Robert P.J. Conney Jr.’s Winning the Vote which includes pictures, posters, campaign banners, and informative essays. Showing a generational connection between mother and daughter is Ellen Carol DuBois’s compelling biography, Harriot Stanton Blatch and the Winning of Woman Suffrage. Finally, the best regional approach is New Women of the New South by Marjorie Spruill Wheeler which helps to explain the multiple levels of resistance to women’s rights.